We moved in June. 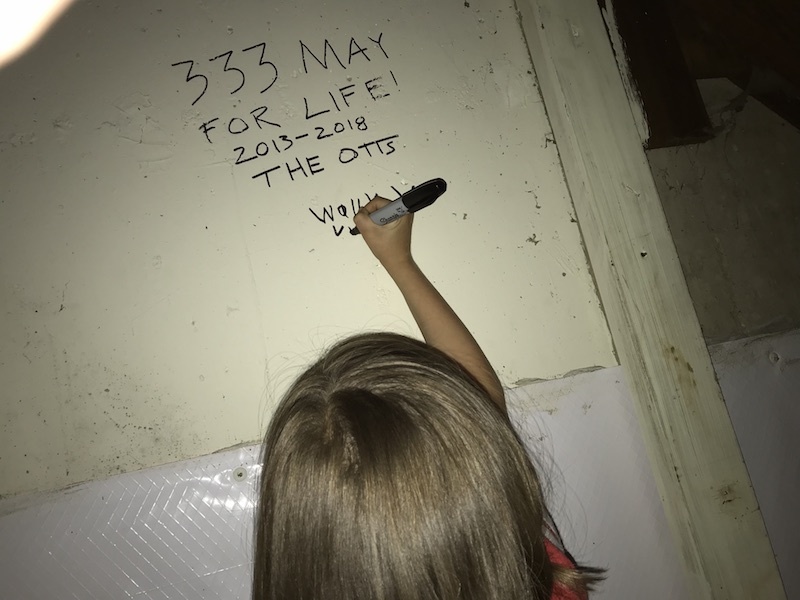 When we told someone we were moving and how much we loved our home and the memories that it held, they suggested leaving our mark. I knew the perfect place. When we had lived in our 50s ranch home for 3 months, I was folding clothes in the laundry room. 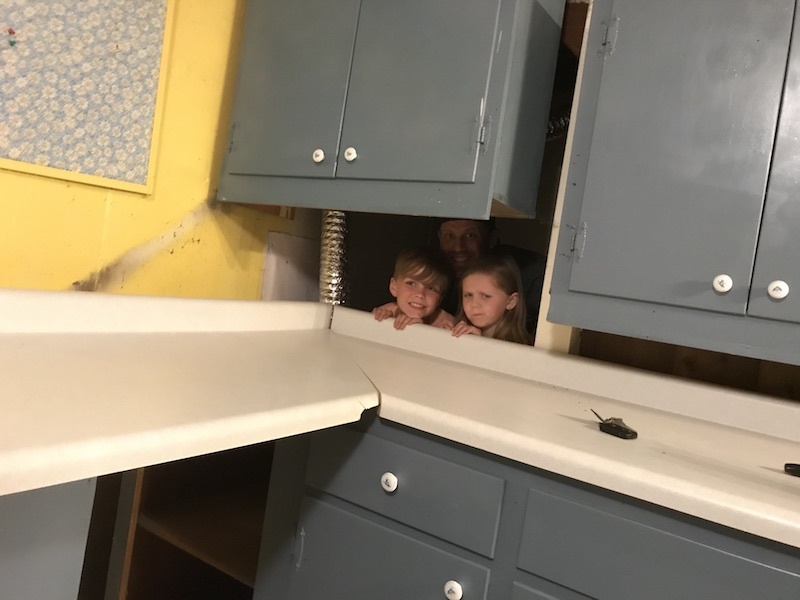 Many homeowners remodel their laundry space to achieve what we had going on here—tons of cabinet space and storage, countertops with room for a laundry basket and a week’s worth of clothing for a family of four. Please don’t imagine anything too fancy. Here, like many other parts of the house, the previous owner had DIYed the space together. Blue cabinets that once lived somewhere else are retro-fitted into the space, and the almost white laminate countertops are sliced to fit and balanced just so to to cover the top of the cabinets. I was in a happy place—folding laundry is the worst, but I’ve managed to turn it into a ritual I look forward to. The key: Lock. The. Door. For 1 hour a week, I get to say I am occupied and no one in the family gets access to me. No, I can’t get you a snack, break up your fight, play Beanie Boos, help you find your sunglasses, kiss your boo-boo, listen to your 36th story about level 3 of your video game. I am having a horrible time in here alone binge watching Glow and Grace and Frankie. Oops, I mean folding clothes for you jamokes. The laundry room was in the basement. The cabinet was on a wall that is adjacent to the stairs. And behind the cabinets, under the stairs, there it was. A hidden full-sized refrigerator. Horrified, I ran upstairs to tell husband Wally. He came downstairs to see for himself, and confirmed I wasn’t dreaming. They had built these cabinets over a refrigerator. “Is it plugged in?” he asked. His thought when he finds a hidden fridge: wasted electricity. Mine? The perfect place to store a dead body. The only way to double check that we weren’t paying $10 a month to keep someone else’s crime a secret was for one of us to squeeze back there. So of course, we tried to convince the kids it would be an adventure. “Think of all the spider friends you could make!” And “Not every kid has a good, ‘I found a dead body in a fridge under the stairs’ story!” They weren’t buying it. Husband Wally and I drew straws and I was the big loser. “Not every mom has a good ‘I found a dead body in a fridge under the stairs story’,” husband Wally said, reassuringly. I contorted myself up and around and behind the cabinets, took a deep breath, and opened the fridge. There I found a whole lot of nothing but spider friends. For the next several years, I wondered what the previous owners were thinking. Why build cabinets around an unplugged fridge? I use the evidence—the fridge, the mish-mosh of cabinets, the DYI sensibility—and I create an entire story of what kind of people they are, the conversations or process that led to that decision, the arguments they might have had, or maybe the matter-of-factness in that easy (lazy?) final thought. For the next several months, I showed everyone who came over my secret hidden fridge. “If you ever need a place to store a dead body…,” I’d say. 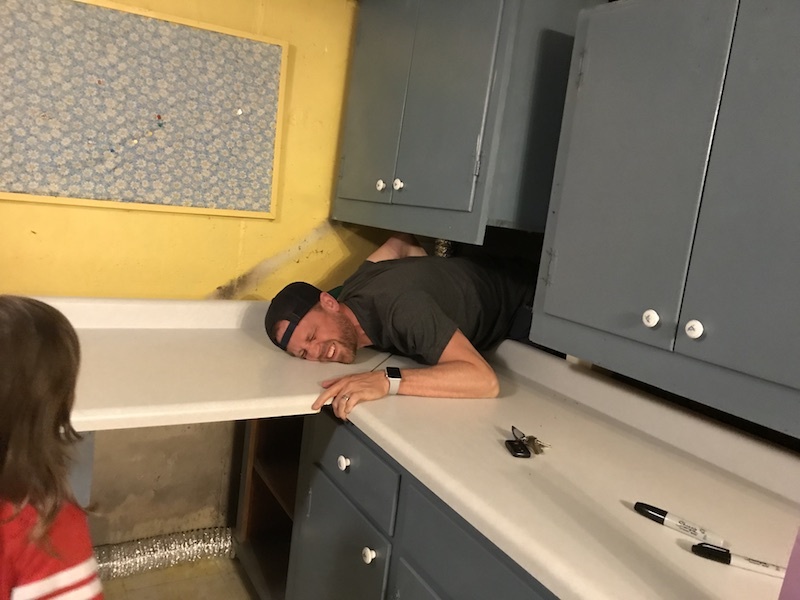 When we realized our friends weren’t the murder-y type, we eventually uninstalled the upper cabinet and pushed the lower cabinets to the side, pulled the fridge out, and collected $50 from the ComEd crew who came to pick it up. 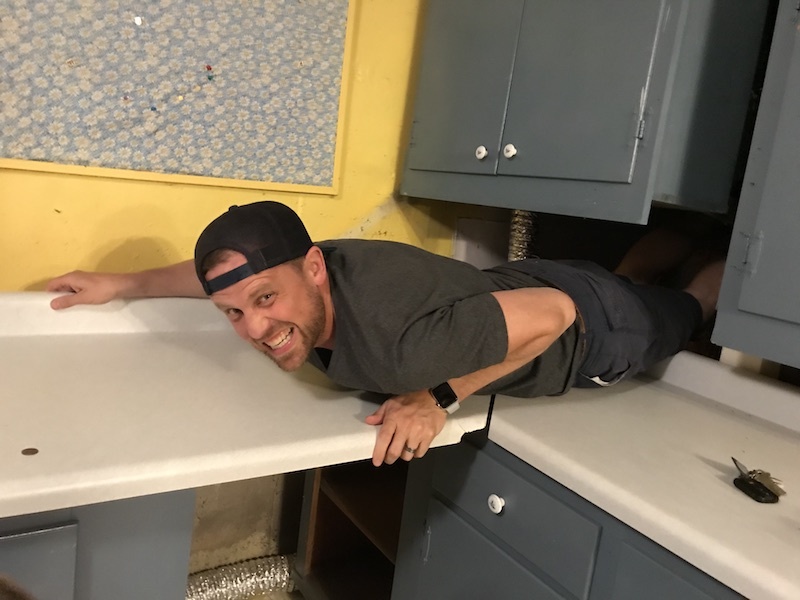 We pushed the cabinets back into place and I remembered the space fondly and enjoyed wondering about the previous family every time I performed my weekly alone-time folding ritual. We sent the littlest ones in first. At 8 and 6 years old, they were into the adventure this time. We passed them between the counter and cabinet, Husband Wally followed (slightly painfully), and I was the last to enter. We like to show the pictures to people in reverse order. Husband Wally and I were just about to celebrate our 10 year wedding anniversary. We had been married on a beautiful beach in Mexico surrounded by 13 family members. I brought only a CD with Ben Folds “The Luckiest,” a dress I picked up at Macy’s on a prom gown sale rack, zero expectations, and a bunch of tropical-looking pink flowers we used for decor at that roughed together, beautiful little ceremony. Getting ready for this move now, 10 years after our wedding, I had done quite a bit of purging things we didn’t need at that point. But I couldn’t bring myself to get rid of that bunch of flowers, which were, in fact, stored in one of those strange blue laundry room cabinets. After we were done writing on the wall, I remembered the bunch and thought of a use for some of them. I handed Wally Ben a flower, expecting him to toss his back and be done. 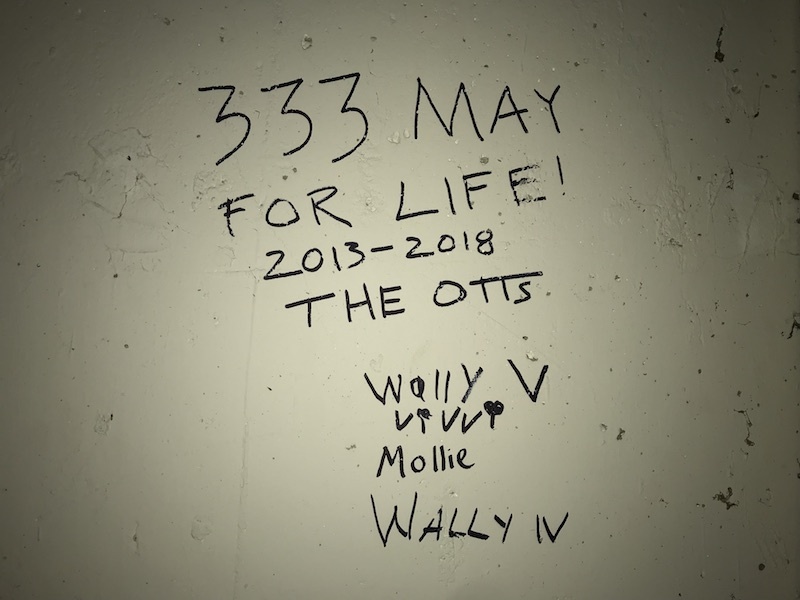 He paused, closed his eyes, and said, “Thank you for this house and all the fun times we had in it.” He opened his eyes and threw the flower into the spidery stairwell that was now marked with our names. We all copied exactly as he had done. And doing so, we said goodbye, leaving the new homeowners with their own thing to discover and wonder about. What a wonderful way to move on with caring and love for where you’ve been!!! !